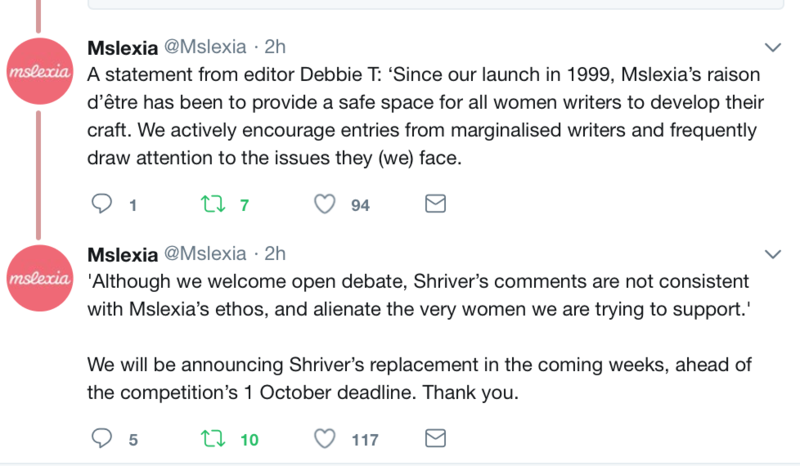 (Being so against the concept of diversity I’m only surprised Shriver ever wanted to be part of a judging panel that ‘favours’ female writers when they ‘should’ be picked SOLELY ON THEIR MERIT, but moving swiftly onwards). But Who Is Lionel Shriver? 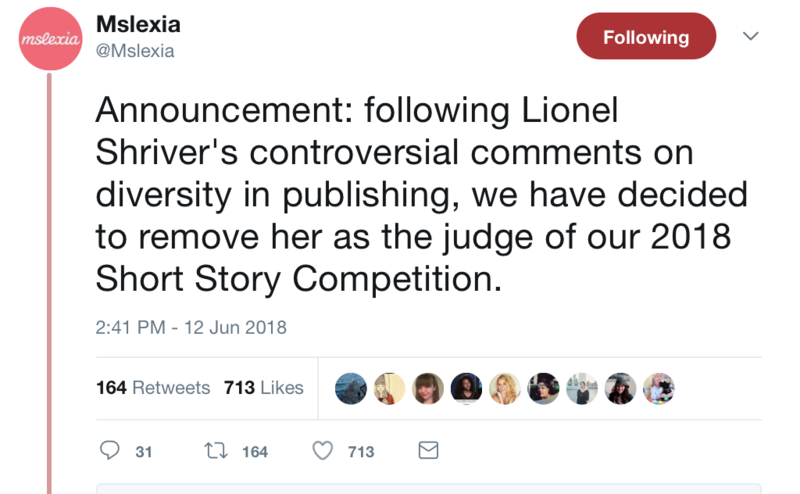 But okay, okay, back up, back up … In case you didn’t know or hadn’t heard of her, Lionel Shriver is a celebrated and accomplished writer in her own right. She wrote We Need To Talk About Kevin (which in turn was made into a BAFTA-nominated movie), plus a raft of other books and short stories, including The Mandibles and her recent collection of short stories, Property. But even if you have never read her work, as a writer you will no doubt have heard of her. Like many writers (including me! ), she is very outspoken on certain issues. In fact, one of the most-hit articles on this very site, 13 Questions On Cultural Appropriation You Need To Ask Right Now, deals with Lionel Shriver’s 2016’s speech at The Brisbane Writers’ Festival and how she hopes the concept is just a ‘passing fad’. Well, two years on and it seems Shriver is now turning her attentions beyond cultural appropriation. Perhaps upset it’s very much not a ‘fad’, Shriver is now sticking the boot into the concept of inclusion and diversity itself. Her recent Spectator article, ‘When Diversity Means Uniformity’ is what caused the upset online; it’s also the reason Myslexia gave her her marching orders. In the article, Shriver takes issue with Penguin Random House’s inclusion policy, Shriver starts with suggesting that a publisher’s ONLY true mission is ‘to sell and to promote fine writing’. Of course, the issue has never been that publication houses (or Hollywood or anyone else in the arts) DON’T want to do the above. I will go into this in more detail, next. I have been banging on (arf) about diversity for nearly ten years now. In that time, I’ve seen radical changes in the industry across ALL mediums, but especially screenwriting. Where once a writer couldn’t get a female and/or BAME lead even read, suddenly we’re seeing iconic properties like Marvel building diversity into its business model. Let’s be clear. The likes of financial behemoths like Hollywood follow the money; so do other creatives, to a lesser degree, depending where they are on the ladder. They have to. Without money, there are no movies; no TV shows; no books. What’s more, in recent years it’s become clear diversity SELLS. Whether you like that idea or not – and Shriver certainly doesn’t – it seems weird she should advocate literally leaving money on the table. It comes down to this: agents, producers, filmmakers and publishers are not patrons of the arts. We can fight this – and lose! – or accept the inevitable and get our writing taken seriously in the marketplace. The clue is in the name. But, in one sense, Shriver is correct: a publisher’s remit *is* to SELL. Where she’s wrong is that slippery concept of what she calls ‘fine writing’. Whenever anyone mentions inclusion or diversity in the arts, someone will pop up and insist the creative arts is basically a meritocracy. That person – like Shriver – will say that the BEST writers and creatives should *only* be selected on the basis of their talent and hard work. They will claim they made their own way on that basis and anyone ‘different’ to them should do the same, or it equates to ‘special treatment’. more white creatives than BAME creatives? or male creatives than female creatives? more straight, cis (non trans) creatives than LGBTQ* creatives? or abled-bodied creatives than disabled creatives? more Oxbridge-educated creatives than those who went to comprehensive school? Is it really because we are supposed to believe those celebrated creatives are somehow BETTER than those who are not these things? That somehow female writers, black writers, gay, bi or transgender writers, poor writers, or writers with disabilities are not *as* capable of ‘fine writing’ as standard? Seriously??? As already mentioned at the beginning of the article, Shriver has already made her name as a writer. I can’t imagine she’s afraid of all these supposed big, bad diverse writers snapping at her heels … Plus I’m sure she would have learned how to share as a child. Of course, Shriver is her own example. ‘I did it despite crap odds as a female writer, so everyone else should be able to do it too’ is her basic mantra, here. Or as I like to put it, ‘I’m alright Jack’. Well, guess what? I did it too. So did JK Rowling. Whilst I have yet to achieve the heady heights of Rowling’s fame – or Shriver’s, now we mention it – I do suspect we had a lot further to travel than Shriver did. Maybe because of that, we have more empathy for marginalised writers? Whatever the case, it does not hurt me in any way to acknowledge any advantages I might have had along the way, or still get on my journey. One obvious advantage is that I am white, in an industry that was set up predominantly by white people. Yes, I was a teenage single Mum; yes, I had many challenges along the way, including cancer and all kinds of other crap. It was not easy. Nothing in my life has ever been easy for me. But acknowledging I had an advantage is not saying it WAS easy for me. I don’t have to acknowledge the system exists to benefit from it – and that’s precisely why my whiteness was to my advantage. Most people in the industry are white. No one thinks whiteness is exotic, or strange, or anything else. It is the default. This means being white is an advantage. It is not rocket science. Don’t be caught on the wrong side of literary and screenwriting history like Shriver will be. She might get the column inches and Google hits now, but burning bridges has never been a sustainable BUSINESS model, nor has it helped CREATIVITY. (Nor, indeed has it helped you get gigs judging writing contests either!). Greater inclusion means more POVS, which in turn means better writing … plus better opportunities to reach audiences overlooked before. How can a writer serious about their craft and storytelling NOT want to do that? But okay, fine: even if you don’t give a toss about diversity politically, why would you literally wreck your own chances when said audiences have spoken? They WANT diversity and they have voted with their £££. It’s our job as creatives to give it to them. So you gotta keep up … Or you’ll get left behind, like Lionel. 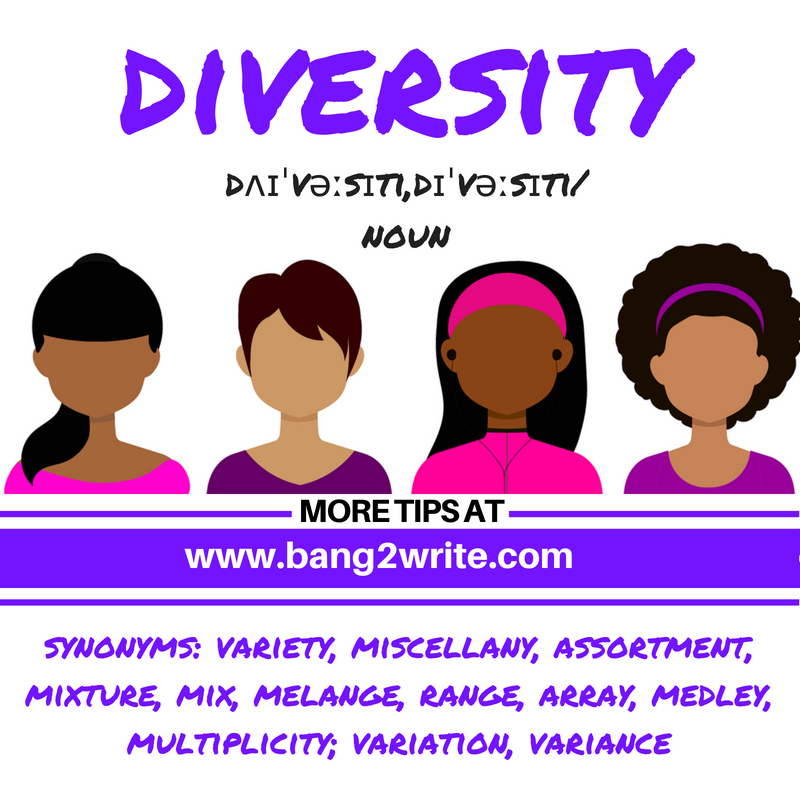 Want more about diversity & writing? I gave the keynote speech at the City Lit Festival of Writing last weekend, probably around the same time Shriver’s article went online spookily! 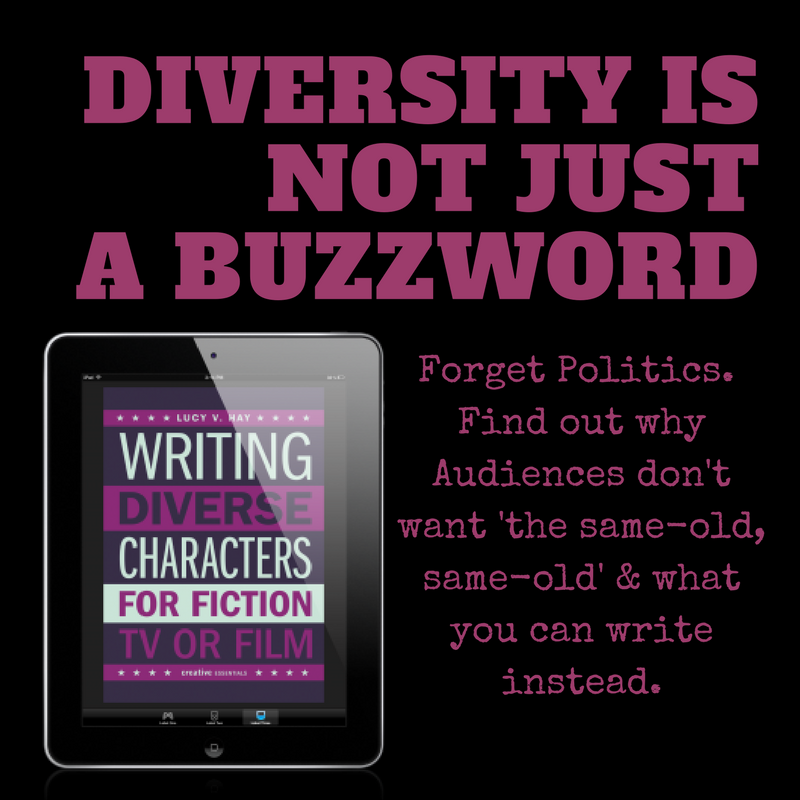 It was called ‘Diversity in 21st Century Fiction: Telling Untold Stories’ and you can read what went down, HERE. 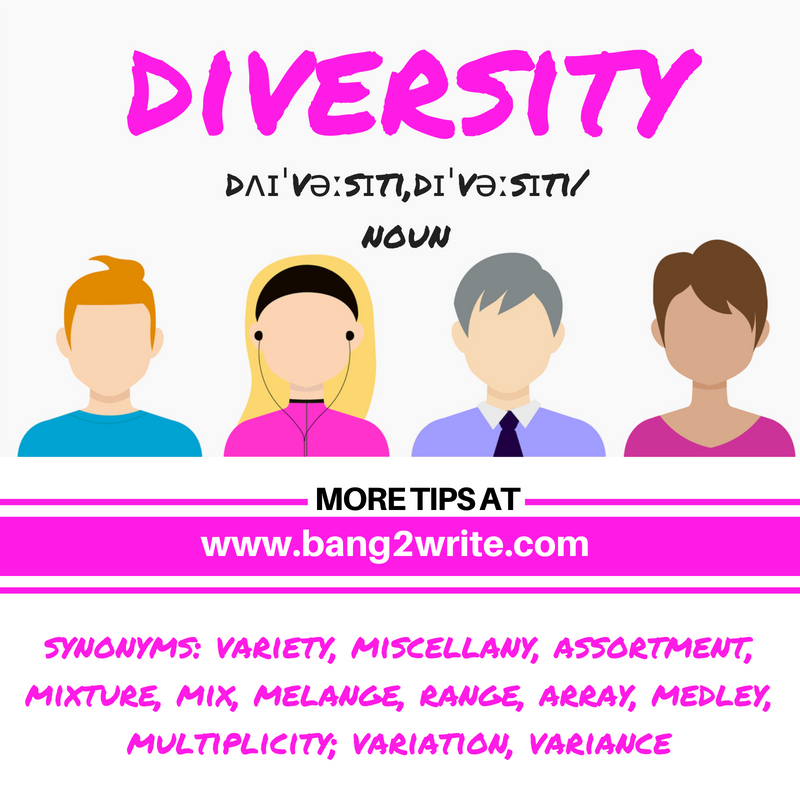 You can also check out my book, Writing Diverse Characters For Fiction, TV & Film, out now from Creative Essentials. Available in paperback and ebook, from Amazon and all good book stores. Click on the link or the pic below for more info.